JamaSMS.com | HOME. Best and Cheapest Bulk Sms Website. All you need to do is Click on Register (if you dont have a username and password already, Login with your Username and Password and Send your customised SMS to all networks in Nigeria. We GUARANTE bulk sms delivery for Individuals, Business, Churches, Publications, Estate Agencies, Professionals, Organizations, Sports, Clubs, Marketing companies, etc. JamaSMS system is an SMS based leads communication operating for your business 24/7. WHEREVER YOU NEED TO BE, We can Provide you with SMS service in 1.79 seconds. JAMASMS.COM allows you to create and manage your own bulk sms website at the simplest platform. 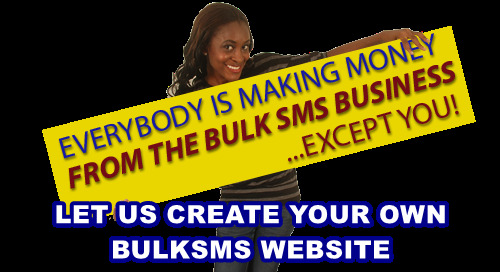 As a RESELLER, you buy sms units at 90bkobo only and sell to your end users at your own price. You can send Bulk Text Messages (SMS) from JamaSMS.COM to cell phones, both GSM and CDMA networks. BUILD YOUR RESELLER SOLID SMS Platform with Quality SMS Gateway for Nigeria. Professional, Quality and Ready-to-Use SMS Website. Set your own sms price.